to help you and your organization be healthier, more productive, and get ahead. Web Site Copyright ?000-2014 by and designed by Carol Goldberg, Ph.D. "Getting Ahead Programs,?logo design, and slogan “Close the gap between where you are and where you want to be?are ?Registered Service Marks U.S. Patent and Trademark Office. In the same time you can speak to one person, you can speak to a room full of people. Thus, public speaking is the most efficient and effective way to introduce services and products to large numbers of potential clients and to obtain funding. Yet public speaking is the #1 fear. Those afraid even to speak at in-house meetings miss opportunities for advancement because silence is equated with having nothing valuable to contribute. Moreover, those who speak may get credit for ideas developed by publicly silent team members. When employees are comfortable speaking at staff meetings, they gain attention and their organizations get ahead via innovative ideas, team building, leadership development, and spin-off of employees motivated by group recognition. 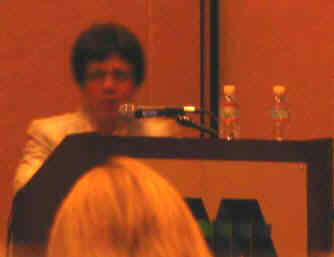 Dr. Carol Goldberg developed Public Speaking for Professional Success? Workshops to teach professionals to speak comfortably and effectively in-person, on television, on radio, in videos and DVDs, and to print media interviewers. She can include this with sales training for your staff. Although workshops are for groups, she does media coaching for individuals, even long distance. Dr. Goldberg teaches stress management and how to speak comfortably to audiences. In workshops, she provides practice in front of audiences, without competition, timing, or counting "ers" and "ums." However, her workshops are not just for those who find public speaking stressful. They are opportunities to polish work-related speaking, with practice and feedback. For details about public speaking training with PowerPoint, see the Featured Workshop on the home page, "How to Speak with PowerPoint?